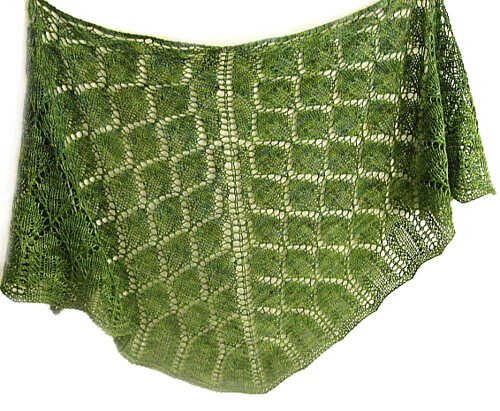 Midnightsky Fibers: New Leaves Shawl Pattern! The shawl pattern is finally done! Pattern will be available on my website soon, I am upgrading the website so in the meantime you can get it on Rav. Since it is my birthday tomorrow (June 8! ), I will have it up for a special price for the next couple days. After it will go up to the usual $6.00 pattern price. I love this shawl- the charts were annoying to make, but knitting it is a breeze if you know how to read charts! A nice thick yarn makes for a quick project (I knit it in two days- and read several books at the same time!). Quick to knit with just 500 yards of worsted weight yarn, this shawl is perfect for when you want a shawl without a super lacey look. Blocky leaves twine down from the center, with simple repeatable leaf motifs making up most of the knitting. 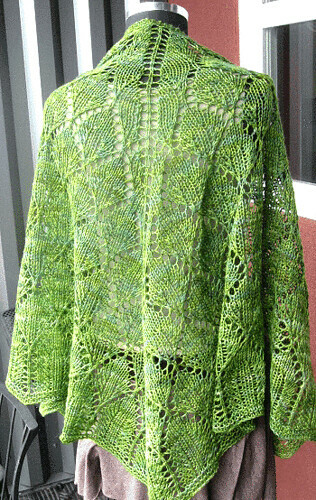 The shawl is knit from the top down. Garter stitch edges the shawl to prevent curling, and the simple edging on the bottom produces subtle points. Pattern includes large full color easy to read charts. Gauge: 3.5 stiches/inch in lace pattern (14 stitches over 4 inches/10 cm). Take time to check your gauge. Skills: Intermediate: Casting on, binding off, increasing, decreasing, intermediate skill at reading charts. If using a handpainted yarn, it is best to work with 2 skeins at once to prevent obvious differences in the skeins from showing and to help prevent pooling. Included are additional charts to make the shawl larger or so you can use lace weight yarn-(you will need more yarn if you change the yarn weight or add more rows). 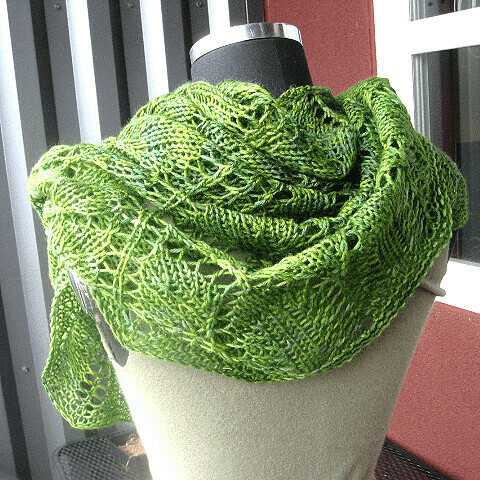 The cast on for the shawl is sometimes called the “garter stitch tab cast on”, as made popular by Evelyn Clark. It makes for a neat cast on that matches the garter stitch border. Odd rows are charted. For even numbered rows, knit 3, purl across to last 3, knit 3. This creates the garter stitch edge. You might find it helpful to place stitch markers before the first and last 3 stitches to remind yourself to always knit the garter edge, as well as putting a maker on each side of the center stitch.